For a long time, accounting has been archaic, convoluted and obtuse. From the beginning, we knew that by harnessing the most recent technology and putting our customer at the forefront – we could create a service that was more modern, more personal and, of course, successful. And we were right! We’ve received the Queen’s Award for Innovation in recognition of the waves we’ve been making in the profession, we’ve been named AccountingWeb’s Practice Excellence Pioneers for our untypical, trailblazing practice and best of all our client satisfaction is eight times higher than the UK average. We’re now a nationally renowned business with huge plans of where we’re scaling up to next. But, back at the start, there weren’t many who believed in what we were trying to create with inni. Matt and Dean, long-term contractors, were becoming increasingly frustrated with the service from their accountants. While most the advice was accurate, the whole process; from cumbersome Excel spreadsheets to long delays for even the simplest of questions, seemed outdated. As professional engineers, they hated uncertainty, inefficiency, and having to work with decisions guided by rules of thumb. 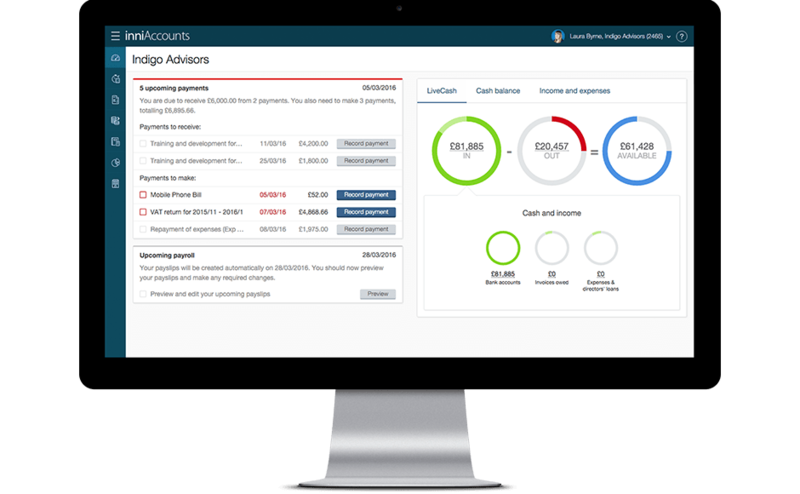 Venting these issues to James, whose software development skills promptly kicked in, the three began to design their dream online accounting service – one specifically tailored for contractors and freelancers. It needed to be a single solution for storing all financial information (no more spreadsheets), and most important of all, it needed to work in real-time, with accurate tax calculations available 24×7. While the three co-founders certainly knew a lot about running businesses, none of them were accountants: which is problematic when you want to build an accountancy practice! While software development was underway, the team set about finding an accountancy partner. This proved to be the biggest challenge in getting inniAccounts off the ground. Over the course of three years, inniAccounts worked with three local accountant firms in succession. Each time the relationship broke down because traditional accountants were simply too set in their ways. No accountant thought the software would be able to interpret the complexities of the tax system in real-time. No accountant thought clients would want email support (it was 2005 – what were they thinking!). No accountant understood the efficiency benefits of technology. And some of the accountants were incredibly greedy: they were too preoccupied with selling financial products, rather than giving sound, impartial advice to clients. The end of this three year period marked the lowest point in the story of inniAccounts. We had a working product, and we knew how we wanted the support model to work, but we couldn’t find a partner to help make it happen. Our personal savings were depleted, and we were close to giving up and returning to our corporate jobs. But then we had a breakthrough: Paul and Rowena joined the team. Paul was a contract software engineer working on a web-based app at Vodafone, where he and James crossed paths. Paul was an incredible engineer, and could bring the quality and technical leadership that inniAccounts would need to grow, and deliver the accurate and reliable service that our clients would demand. When Paul’s contract at Vodafone ended he joined the team. At a similar time, Rowena joined the inniAccounts team as a part-time accountant to support our small, but growing, client base. Rowena had previously built and sold two accountancy practices, and brought with her an incredible depth of knowledge, but more importantly, a refreshing outlook. Rowena understood exactly what we wanted to achieve, and could see the benefits for clients and inniAccounts alike. It soon became apparent that Rowena was the partner we’d been searching for over the last three years. These two heavy-hitters gave the team the confidence to make a bold move: they bought out their accountancy partner, took control of the entire inniAccounts operation, and ushered in a new business model. Paul was made Director of Technology, and Rowena became Director of Client Services. The stage was now set with five experienced and innovative directors, who had complete control over inni. The impact was immediate and profound. The team drew upon renewed energy and set about driving awareness of online accountancy, while building scalable support systems and technology to deliver the vision of inniAccounts. Many successful start-ups talk of a ‘hockey-stick moment’ – a point where investment in product and service development bears fruit, in the form of explosive growth. inniAccounts was no exception, and over a period of 12 months our client base grew from tens of clients to hundreds of clients, and has continued to double every year. While you would expect a business experiencing such growth to have major teething problems, this simply wasn’t the case for inniAccounts. Remember that many of the directors came from industries (such as aerospace) where failure wasn’t an option, meaning that reliability and scalability was built in from day one. They’d successfully taken innovation and best practice from other industries and applied it to accountancy. Over the last 13 years, we’ve provided accountancy services to thousands of contractors, consultants and freelancers. We’ve helped people make a break from fulfilling corporate jobs to life as valued independent professionals. We’ve also helped many old-hands retire their spreadsheets and regain control of their accounts. Today we have a thriving and diverse team, spanning accountancy, development, operations and marketing. We’re particularly proud to be creating opportunities and careers for young people, from school leavers who will, over the next decade, become chartered accountants, through to apprentices who are keen to put their software development knowledge into practice. We combine this with the grey hair of experience, and it’s a winning combination. We have the energy, creativity and open-mindedness of youth driving the business forward, with experienced hands on the tiller, always navigating us in the right direction. The result? A brilliantly talented, friendly team who are capable of delivering market-leading innovation and service quality that’s second to none. We’re still constantly moving with the times and embracing the newest and best technology to improve inni; from integrated AI to mobile apps and harnessing data to create a more streamlined experience. We’re incredibly excited about the innovations we have coming. Take a look at our blog to find a little more info on what we’re working on. Having known James and Paul from the Vodafone project days, I know just what a dream team they were, and continue to be… and as a very happy customer, I’m not surprised what a fantastic service inniAccounts is!